Capable of countless different tricks and stunts, Battle Spin Warriors allow children to play on their own or with friends, throwing the discs between the hand held spin dishes or power-launching the spinning discs on to different surfaces. 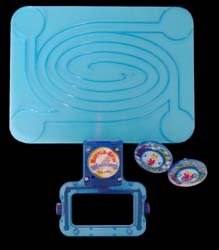 We were sent a copy of the latest Maze & Mini Dish which provides the player with a maze through which to guide the spinning disc before it reaches the end of its spin. I might be missing something here, but I just could not get the maze to function as it was supposed to. Once I put the spinning disc on the maze it just jumped straight off and onto the floor. So, not to be beaten because I am an old thing (30+ if you must know) I invited a couple of my younger relatives to have a go. No one over the age of 12 was that interested and a nine year old nearly lost his fingers to the spinning discs - they are surprisingly painful if they make contact with your skin. So the mere idea that kids are supposed to chuck these at each other and catch them seems very strange - Oi! You could have someone's eye out with that! When I was younger there was something very similar to this where four spinning gladiators were set off in a large ring and would bash into each other. The idea being, the last one left standing was the winner. Now that was fun... and you can do that with the Battle Spin Warriors. I suggest you do. It'll be much more fun than trying to negotiate a maze that the warriors don't want to stay inside.